About the Event: 2016 celebrates the 13th anniversary of Wine & Spirits Top 100 Tasting. It’s an event honoring wineries from around the world that provided the best overall wine performances in W&S tastings (conducted by W&S staff, expert sommeliers, and retailers) and received the highest marks from W&S staff critics throughout the year. Through the course of the evening, consumers and industry experts alike sip and savor over 200 wines as well as enjoy small bites from restaurants on the magazine’s elite SF50. From the Editors: Tara further clarifies that the W&S tastings are conducted between December and October, lead by 6 staff wine experts. It’s not exactly hard for wineries to get their wines in front of the judges — they simply just have to submit them. As Luke says, “We taste any and all grape wines, so as long as they don’t have additives like, say, chocolate or herbs… we run them through our blind tasting panels.” The W&S experts split up the wine-world amongst them into 6 regions (1 region per staff expert) to help tackle this astronomical project — and to ensure that each region is judged amongst its peers, “We’re never literally comparing California pinot noir to, say, Burgundy or New Zealand in our blind tastings,” says Luke. All tastings are blind, conducted by the 6 W&S staff leads along with regional experts — sommeliers, collectors, wine retailers, and other industry professionals. Together they swirl, smell, sip, spit, and repeated. Ultimately they choose amongst themselves which wines, to put it plainly, are the most enjoyable. Both Tara and Luke stress that besides taste, the expert panels are tasting for wines with a sense of time, terroir, talent, and…food. Yes food. “At the end of the day, wine is meant to be consumed and food gives wine context,” Tara says. Tara, who’s been a part of this program since 1997, says one of the joys of participating is learning from all the other tasters. “I may taste a wine and think, ‘I don’t really like that,’ but then a sommelier will say, ‘I would love to have this wine with this dish or that dish,'” Tara says. And that mouth-watering food and wine description is sometimes enough for her to re-evaluate and even change her opinion of a wine. And what better way to celebrate the best of the best in the whole wine world than opening the doors to the public to taste and debate those choices themselves? Tara says she loves this event, not just because she gets to experience the reactions of the consumers, but the reactions of the winemakers — some who don’t even speak the same language — engaging, learning, and getting excited about wines from regions clear across the globe from their home vineyards. 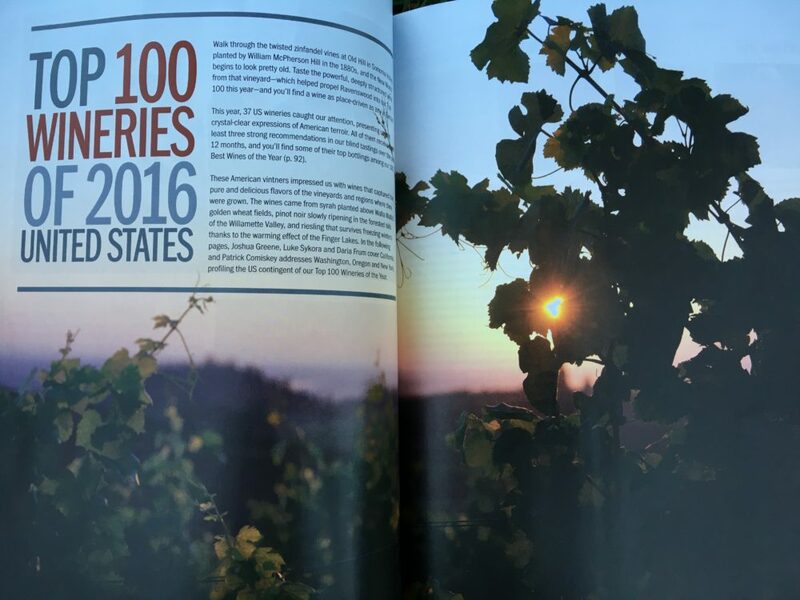 About the Buying Guide: The Top 100 Tasting event also marks the sneak preview of Wine & Spirits 30th edition “Annual Buying Guide,” scheduled to be on stands alongside the magazine’s current issues through January 2017. It’s slated to be the “go-to” resource for the average wine consumer, showcasing the “most drinkable wines, standout vintages, and producers” as selected from those very same W&S expert critics mentioned above, who have tasted over 15,000 wines to produces this guide. The guide features, not just the winery names and specific wine reviews, but profiles of each of the winemakers, the winery’s history, and — yes — the selected wine. In short, it’s a great way to travel around the world via wine and discover new places and products you may not have heard of otherwise. More Info: With over 100 wineries showcasing numerous bottles, it’s impossible to feature each one exclusively. So, I want to highlight the wineries that not only had some of my favorite sips of the day, but that also had winemakers present representing their product with pride — because it really means something to me as a wine writer and studier when I can learn from the lips of the artists. About the Winery: It’s the classic tale of three friends who wanted to start a passion project and actually succeeded. Baron, Noah, and Steve all worked in the wine industry in some capacity already — marketing, importing, and even winemaking — but it wasn’t until just recently, in 2009, that the triad of wine lovers decided to embark on their own brand. It helps that they got their first stock of Pinot at a bargain price due to recession-like issues at the time. With a low per barrel price, they figured it was worth it to take the risk. Never did they think they’d be the successes they are today. About the Wine: Though less exclusive than a single-vineyard offering from these boys, winemaker Noah is quoted as saying, “If you let got of the concept that single vineyard is better, you can maybe make a better blend.” And so, Marine Layer is made from a mixture of a few vineyards along coastal Sonoma. Flavor Profile: This Pinot Noir packs a sea-worthy punch. Close your eyes and breathe in, and you’ll swear you’re standing on the top of a foggy cliff overlooking the Pacific ocean. Take a sip and bright just ripe berries burst all over the tongue right away. Let it linger and that funky beachy minerality comes through reminding you that 80% of this wine comes right from the heart of the Petaluma Gap. Food Pairing: What else? Seafood. Have this wine with a heartier fish to help elevate the body. I’m thinking a salmon, pan seared, atop a salad of dark, leafy greens. More Info: I’ve yet to visit Banshee, but I hear it’s a party every time you go — even more so during, get this, Banshee Fest. And if you can’t make it to that event, they’ve got a whole page dedicated to places they’ll be hanging out, pouring wine, and having a good time. 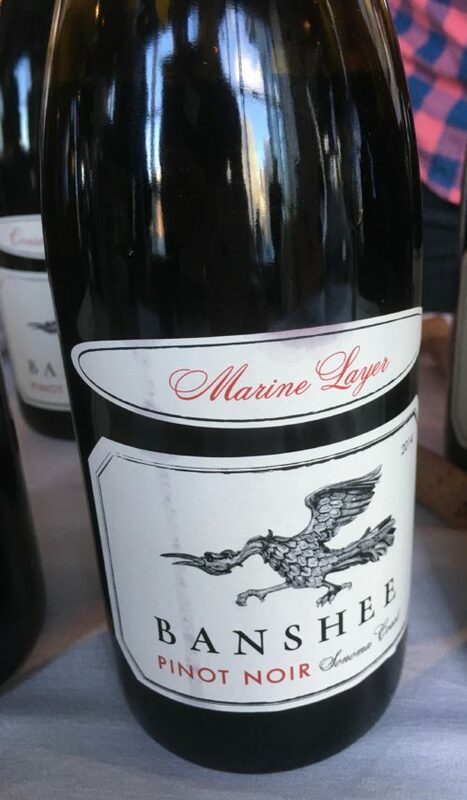 For more information about Banshee, and any of their wines, please do visit the Banshee website. Flavor Profile: Talk about terroir. On the nose, the Pinot Noir emits a savory scent — olives, onion, herbs. You ready yourself for something big and bold — maybe one of those rare tannic Pinot Noirs. But on the palate, the primary mouthfeel is quite light, bright, almost refreshing. If you sipped and swallowed too soon, have another go and savor it because there’s some depth and complexity here. Mid palate you’ll start to get a vegetative flavor that flows into more of a fertile soil sensation, which paves the way for a clean, crisp finish, closing the circle with another dose of fruits, albeit this time a bit darker, grapey-er. It’s a total terroir tale. Food Pairing: Enjoy this with something a bit more substantial than you would a “classic” pinot. Pay homage to the dirt and earth and roast up a lean but game-y meat like duck or pheasant. Pair that with some roasted root vegetables and you’ll have a celebration of farm fresh produce on the plate and in the glass. More Info: You can’t visit Hirsch unless you’re a member or call them to specifically book an appointment. But small, family-owned wineries like this are worth joining the club. 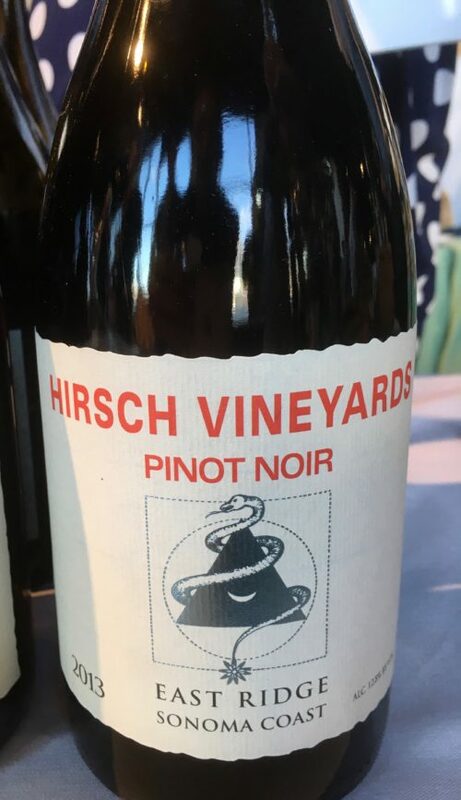 For more information about Hirsch Vineyards and their wines (and to join the club of course), please visit the Hirsch Vineyards website. 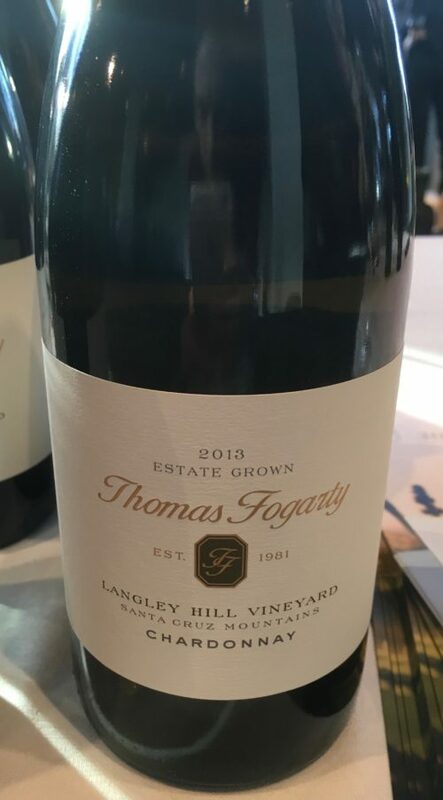 About the Winery: I spent a long time talking to Tommy Fogarty of Thomas Fogarty Winery — about the family, the land, the plans (that are finally put in place) to become a sustainable, organic property. And, not unlike the other winemakers and proprietors I spoke to at the event, Tommy and his team do their best that the wine they present to the public are true testaments to their piece of earth. It’s for this reason that Thomas Fogarty Winery takes more of a “hands-off” approach to the winemaking process, with very little stirring and no added anything. About the Wine: The vines for this Chardonnay are some of the oldest on the property, planted in 1980. As Tommy says, “The vines are all beat up,” so there’s poor water absorption, resulting in tiny grapes. The grapes are pressed whole cluster and go straight to the barrel for aging. The barrels are “seasoned,” (aka old and won’t change the taste or textural components of the wine). And here’s where that no-hands approach comes in, “Even if the barrel gets weird — don’t touch it!” he says. After the barrel, the wine will settle in a steel tank for at least 8 months. The wine is unflitered, unfined — all natural, 100% Chardonnay. Flavor Profile: Straight away, the nose of this wine will engage you with its floral aroma — white flowers, perhaps a few tree nuts, the slightest drip of honey. The initial taste is almost full-bodied texturally with classic Chardonnay flavors of fall fruits and, if you’re paying attention, there’s a bit of funky-cheesey-nuttiness in the back palate (hello unfiltered, unfined). But it’s the finish that’ll move you (most likely towards your next glass). The flavors all come to a point, a kick of acid, a hit of minerality. It’s a tight finish, if not a solid one, and one that will have you thinking of old vines, coastal waters, tiny grapes, and, ultimately, fine wine. Food Pairing: This is a rather complex wine for a Chardonnay. I’d encourage you to drink this on its own, at least at first. Food pairing could go a number of ways, but once again, I’d stick to the theme: farm fresh. Roasted or baked free range chicken breast atop a clean, crisp salad is probably your best bet here. More Info: As Tommy pointed out, if you’re going to visit Thomas Fogarty winery, that’s your destination. It’s kind of in the middle of no where and there’s not a lot to do on your way up or down from the mountain top location. But a trip to the winery is certainly in my future — it’s not too far from my humble abode at the moment. For more information — including istructions on how to trapse up the trail to the winery — please do visit the Thomas Fogarty website. About the Winery: I almost didn’t stop at this table, but I’m sure glad I did — I’m a sucker for a husband-wife partnership. 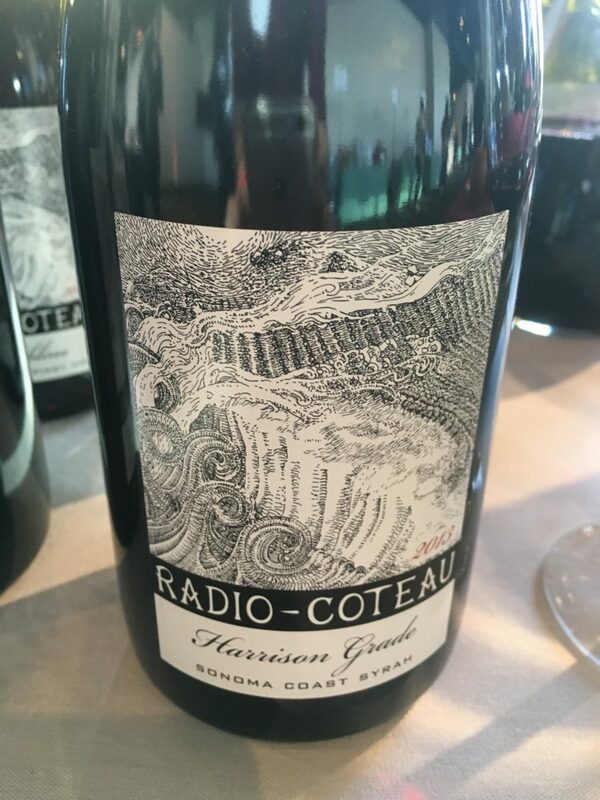 Radio-Coteau is the passion project of owner/winemaker/viticulturist Eric Sussman, but his wife’s on board as a lab tech (enologist) after leaving her career as a doctor to work with grapes. And she loves it. Obviously. 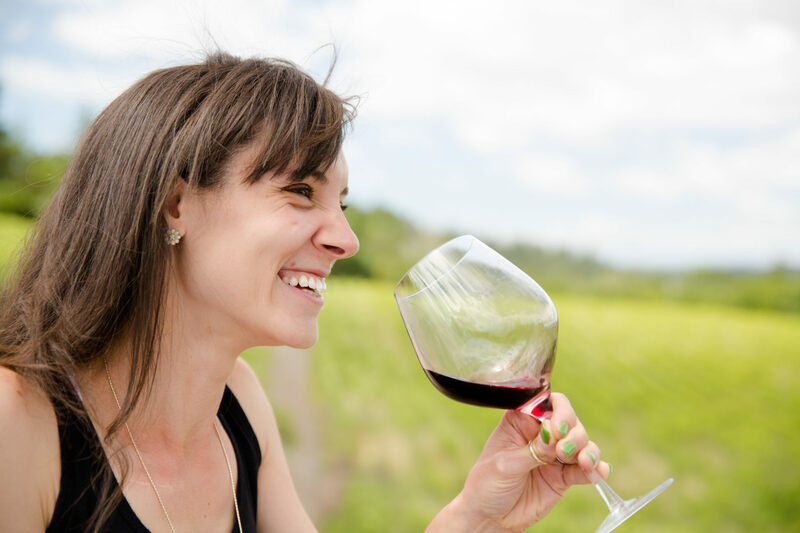 She can’t help but smile with pride as she pours each of their award-winning wines. About the Wine: The Syrah was sourced from winegrower John Dierke in the overcast region of Sebastapool. It was fermented with 38% whole cluster inclusion, aged on the lees for a 21–month in 100% French oak. It then sat in the bottle for 6 months prior to release. The 2013 vintage is slated to age well for the next 10 years. Flavor Profile: Big and bold on the nose, to someone who always associates that with big bad Cab, that may be what you think you’ll be sipping based on the smell. But sip it, this ain’t no Cab, this is a deeply luxurious Syrah. Yes, it’s earthy, it’s dirty, it’s gritty, it’s grainy but it’s all in the context of these deep dark fruits. Secondary to those fruits is the distinct essence of cooking spices, peppercorn (you could argue a bit of tobacco because there is something perfume-y dancing in the background). And despite all of this boldness, the tannins are not overbearing in any respect. Instead, they walk hand in hand with these scents and flavors giving the wine a well-rounded, full body — both in taste and texture. Food Pairing: According to Eric, this wine pairs best with lamb. Agreed. So, you’re thinking, Hey, Stace, did you only sip on Cali wines??? No. But you’ll have to stay tuned for my exclusive One-on-One with a Winemaker: Jean Francois Pellet (link goes live Monday, October 17) a talented winemaker who’s produced wine all over the world and has settled in the modest AVA of Walla Walla, Washington. Talk about a passionate man creating terroir-driven wines that speak of time, place, and soul.